The difference between being "Good" or "Elite"
This post won’t appeal to very many people, because not very many people actually want to be in the elite. Most aren’t willing to pay the price, so they are happy to settle for “good”. That’s ok…there is nothing wrong with being good, and having a relatively easy life, and not pushing yourself too hard. Well…nothing wrong other than it leads to being unfulfilled at some point…and it is a waste of talent and opportunity. 2. Understand that it is a journey of self development, investment and an evolving business model. We all start out having to acquire the basic skills that are required to earn a living, and survive….so all of us start at the point where our only focus is on “getting going”. Most professionals go through a reasonably prolonged period of personal development and learning, and get to the point where they are “good”. And that is where most stop…. Few invest in the complex learning and time to position for being “great”, and even less then think about how to leverage the position and knowledge they have developed, and become one of the elite. 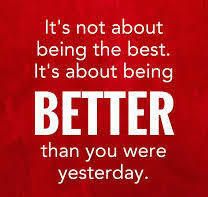 Getting good is ok, and getting great is fantastic, in terms of earning a living. 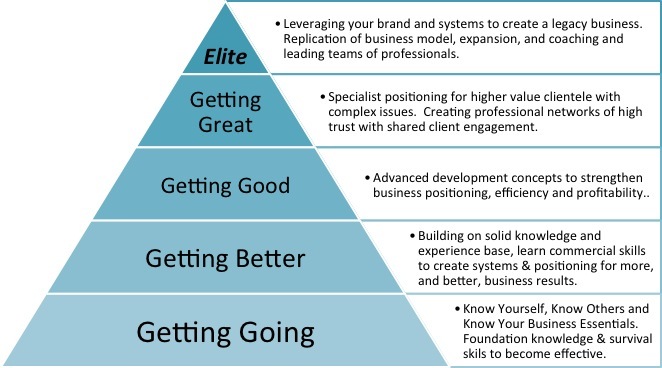 Becoming elite though….well that is about creating a life and a legacy.